You’re speeding down the trails and all of a sudden there’s another bike right in the middle of the path unaware you’re approaching. Add safety and sound to your mountain bike with the installation of a timber bell. Installed on your handlebar, a timber bell sounds as you ride. The more you move your handlebars, the more noise it makes, helping to warn walkers and riders around you of your approach. These innovative bells make a great addition to any mountain biker’s frame and are easy to install without being obstructive to your hands. Why do you need a mountain bike bell? Safer Riding: A mountain bike bell is your chance to warn the riders around you that you are approaching. This will avoid collisions, which can happen on narrow trails. This is specifically appropriate for trails that have features like bridges and jumps that only accommodate one rider at a time. Versatile Installation & Use: Mountain bike bells are great because they can be installed either on the front or back of your mountain bike. This can be useful if you already have accessories mounted on your handlebar like a GPS module. Inexpensive: The best benefit of a mountain bike bell is the fact that they are relatively inexpensive. This means that while it improves the safety of your mountain bike, it won’t break the bank. What are the best bicycle bells? Like anything, when it comes to bike bells you will have plenty of options to choose from. With that being said, you should still consider the use and what you are looking for in your bell. The tone for example is important to consider. You don’t want something on your bike that is too low to not be heard when riding. Adversely, you do not want an ear splitting jingle coming from your handlebars all the time. Another thing to consider is the size of your bicycle bell. This is particularly important for cyclists that have other accessories on the handlebars. A bike computer, a phone mount, or a GPS unit can all be obstructed by the installation of a bicycle bell. This is why we recommend looking at the specs on your new bell so you get something that fits perfectly. Extra features can also be a selling point when choosing the best bicycle bell. A great example of an extra feature that can be found on a bell is the ORP Bike Horn. While it is not actually a bell, it still is a bike horn that can alert riders around you that you’re coming. Of importance with this particular bell is that it actually comes with a small light that can be a great tool to have for any mountain biker. Regardless of what style bell you choose to have on your bike, it’s important to understand that you do actually need one. Not only will it keep you safe while you ride, but also it will help fellow riders and trail walkers aware of your presence. How does a Timber mountain bike bell work? Of all the mountain bike bells, our particular pick is the Timber mountain bike bell. The Timber bell was designed for mountain bikers – by mountain bikers and has many features that reemphasize that point. First, unlike other bells, the Timber bell is constantly making noise without you having to operate it. Instead, the bell hangs on your handle bar and jingles as you ride. Think of a cowbell, and miniaturize it, and you have the exact build of a Timber Bell. Another special feature the bell has is that it can actually be locked so you do not have to constantly hear the bell as you ride. With an adjustment lever you can turn the bell on, off, or lower the level of sound. This provides you with flexible options as you ride. The size of the Timber mountain bike bell also makes it a popular choice among riders because it can be mounted on your handlebars without disturbing your hands or any other mounts you have. Also, in case you would like to install it yourself, the Timber bell is very user friendly and can be installed easily. 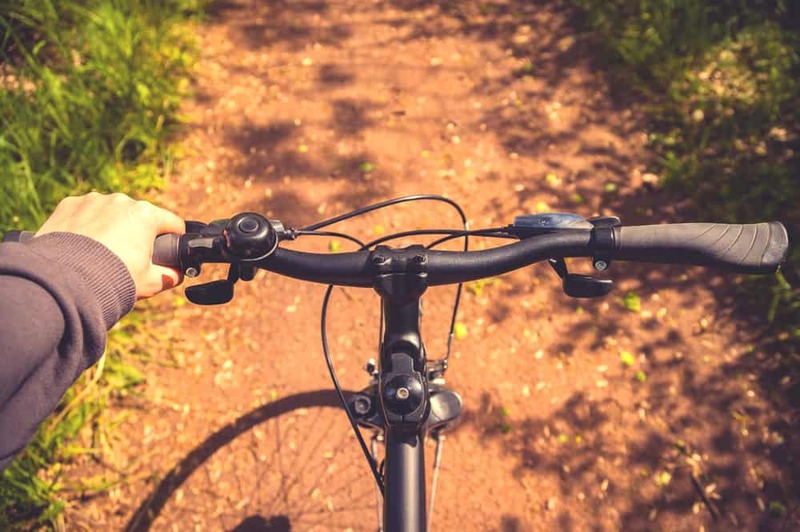 Be sure to consider placement however, as you don’t want the bell to interfere with your brakes or any of the cables that are also found on the handlebars. As mountain bike bells grow in popularity, it’s good to move with the times. More bikers are using them to stay safe on the trails while also respecting fellow cyclists. Get a bell today and join your local mountain bikers on the trails.